The chips are designed for use in low-power devices, including tablets. They incorporate what the US company calls "3D transistors", which it introduced to its PC chips in 2012, designed to boost computational power while using less energy. One analyst said Bay Trail could pose a serious challenge to ARM. Unlike Intel, the British company does not make chips of its own but rather makes money by licensing its designs to other companies, including Qualcomm, Apple and Nvidia, which then adapt them for their own uses. ARM's designs currently dominate central processing units (CPUs) used in smartphones and tablets, while Intel's x86-based architecture is far more common in desktop and laptop computers. This has been a consequence of ARM having the reputation of being the more energy efficient of the two. "I actually do think they have what it takes, but it's not going to be an overnight transition for Intel," said Chris Green, principal technology analyst at the Davies Murphy Group consultancy. "It has huge ground to make up against ARM who really still have a stranglehold on the mobile market. "But this is a great chip on paper for Intel to mount a challenge. Certainly, the fact that it has got backing from the likes of Samsung - who we know is very enthusiastic for the prospects of this chip - I think speaks volumes for its chances in the months to come." 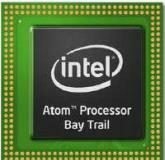 Samsung surprised the tech industry in June when it announced that the 10in (25.4cm)-screened version of its Galaxy Tab 3 tablet featured an Intel chip - Bay Trail's Atom-series predecessor, Clover Trail+. The South Korean firm had previously relied on ARM-based chips made by itself or others to power its Galaxy smart devices. Intel says the new quad-core chips double the computing performance and treble the graphic performance of Clover Trail+. It also introduces the company's Burst Technology 2.0, which can vary which parts of the chip receive the most power to maximise performance without breaching temperature limits. "You might want to take 15 to 20 photos in a touch application and apply some filters to them to get them ready to post to a blog," explained Intel manager Chris Walker. "That's a situation where you'd be doing less with the display, might not be using the camera at all but you'd need to apply the effects very quickly. The CPU can dynamically adjust for that. "Now in a different application, maybe a 3D-rich game which is more compute and graphics intensive, what can happen is dynamically the graphics [processing parts] can go up and take power from other areas. It's just responsive to the user." Mr Walker also highlighted the fact that Bay Trail can support both Android and the full Windows 8 operating systems, allowing manufacturers to offer hybrid tablets that allow their owners to swap between the two environments. ARM-based processors can support Android and Windows RT, however the latter does not support as many applications as Windows 8. Missing ones include the full version of Photoshop and many bespoke programs written for companies. According to a recent study by analytics company Net Applications, Windows RT - which was launched in October - still accounts for less than 0.5% of the global operating system market. Asus recently announced it was stopping making Windows RT tablets because of weak sales and the lack of backwards compatibility. "I would argue ARM should be very worried," said Mr Green. "Intel has started to wake up and realise they were about to lose this race which is why they have really put their foot down and come back with some interesting products." However, the British firm is not resting on its laurels. On Tuesday it released a video showing how Samsung's forthcoming ARM-based Exynos 5 Octa chip - which has eight CPU cores - makes use of its Big-Little design while being used to play video game Angry Birds. Big-Little refers to the fact that four of the CPU cores are more powerful but also more power-hungry, while the other four offer less computing power but are less demanding on batteries. According to what the user is doing, different ones can be switched on and off to ensure the owner gets the best mix.